MPAC Ltd. Install automate and maintain the Smart Storm product range of effluent treatment solutions. Smart Storm design and manufacture on site treatment plants for the treatment of industrial waste water (effluent). Waste water treatment plants provide manufacturing and processing companies with the means to significantly reduce their final effluent bill by breaking down or removing organic compounds in the effluent stream. Often, an effluent treatment plant can give a payback through bill reduction within 2 years. Ensure companies meet their regulatory discharge consents (COD, Suspended Solids, Fats, Oils and Greases, pH, etc.). Generate substantial cost reductions on effluent bills. Smart Storm Bacterial Treatment Plants (Bioreactors) provide processing companies with the means and processes to significantly reduce their final effluent bill by breaking down organic compounds in the waste stream through the use of targeted bacteria and enzymes. Our natural biological products are used in the petroleum, food and agriculture, and hazardous waste industries to degrade target substances in waste water systems. A bioreactor reduces COD, Suspended solids and targeted substances such as fats, phenols, sulphates, etc. Waste Water Bioreactors work by introducing targeted bacterial strains into the waste stream usually in a large retention tank which is aerated. The bacterial strains digest organic products in the waste stream as a food source and then produce a harmless by-product of CO2 and H2O. Waste producing entities such as food and drink, oil recycling and vegetable processing factories benefit greatly from the use of bioreactors, as these industries have high organic loads which are easily digested by our powerful bacteria. Bioreactors are also extremely efficient at reducing unpleasant odours. Smart Storm provides tailored series of biological digestants – 100% natural products. 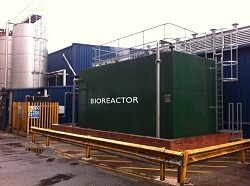 A Bioreactor saves you money, improves the environment and reduces your carbon footprint. 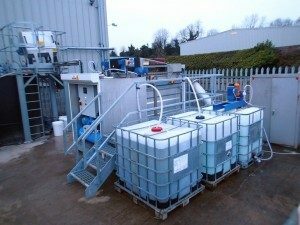 DAF systems are specifically designed for the efficient removal of suspended solids, fats oils and greases from process or waste water streams. Discharges of extremely high clarity will be generated offering massive cost savings and trouble free discharges to sewer or watercourse. The DAF system provides the energy for effective flotation in the form of extremely fine air bubbles, also known as ‘White Water’, These minute air bubbles readily attach themselves to the suspended material within the waste stream. This attachment of bubbles to the particle reduces the density of the particle resulting in increased buoyancy. All the solids present within the DAF cell float to the surface forming a solid scum which can then easily be removed by a simple but effective scraper mechanism. Whilst more expensive than biological reactors, DAF systems can often produce a better water discharge quality.